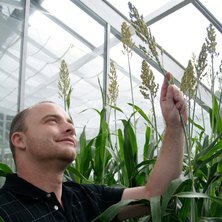 Dr Bradley Campbell has over 10 years’ experience in plant biotechnology research and since 2003 has held a research position focused on plant molecular genetics at the University of Queensland in Brisbane, Australia. His research involves the use of biotechnological tools for crop improvement, with an emphasis on the sustainable production of grain crops. Major focus is on the improvement of crops for food, feed and bio-industrial end-uses, particularly in sorghum and rice. Current projects involve the identification of cold tolerance QTL at the booting stage of Australian rice lines to combat abiotic stress and allow aerobic cultivation. Also, the analysis of genes effecting sorghum starch and grain quality utilising bioinformatic and GM technology. Devadas, R., Vicendese, D., Erbas, B., Medek, D., Haberle, S. G., Newnham, R. M., Johnston, F. H., Beggs, P. J., Jaggard, A. K., Campbell, B., Burton, P. K., Katelaris, C. H., Newbigin, E., Thibaudon, M., Huete, A. R. and Davies, J. M. (2016). Remote sensing of phenology: a dynamic tool to inform allergenic grass pollen aerobiology. In: Meeting of the European Academy of Allergy and Clinical Immunology, Vienna Austria, (196-196). 11-15 June 2016. Campbell, Bradley (2011). The role and potential control of retrotransposons in somaclonal variation of barley transgenics PhD Thesis, School of Agriculture and Food Sciences, The University of Queensland.